Tamarit Park is a holiday camping site which represents true Mediterranean splendour. Found in Tarragona only one hour south of Barcelona, luxury camping has never been more of a reality. Unsurpassed camping luxury is now a reality thanks to the amenities offered at Tamarit Park. Those who are interested in booking such a camping holiday here should contact the professionals at Lux-Camp for further details. What is on offer to campers staying at Tamarit Park? Tamarit luxury camping park is located very close to the beautiful, long and wide sandy shores of the Mediterranean Sea in an idyllic location. It is also very easy to reach from the national road network and motorway. Offering camping luxury, Tamarit Park holiday camping site is in a holiday resort area of the coast and just a few minutes' walk from the beach. If you would like to go ahead and book your holiday, Lux Camp is happy to help. Alternatively, should you have any questions before making your reservation; we will be delighted to hear from you. Why should you choose Camping Tamarit Park? Lux-Camp offers accommodation in spacious and luxurious mobile homes. Electricity, water and gas are provided and Wi-Fi connections are available too. The site provides good facilities for disabled guests. The walkways within Tamarit Park and its camping positions are partially shaded by palm trees; the children’s park has a covered play zone for protection from direct sun. A baby changing room is available. There is so much on offer both at Tamarit Park and in the local area within easy travelling distance. Organised activities are available for children; spinning (fitness) classes are held and cycle hire is available on site. Ideally located for a seaside camping holiday, there is direct access to the western end of a long, sandy, gently sloping beach with clear, shallow water. Here, surfing and sailing are also possible and these can be arranged through the campsite, if required. A boarding point for boat trips is within 1 kilometre, while boat hire is 5 kilometres away. Other Costa Dorada bays and coves within just a few minutes' drive. 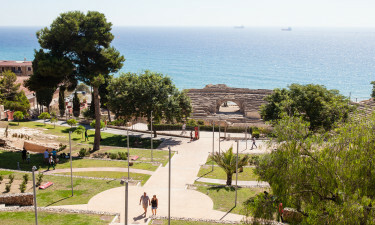 The nearest towns are Tamarit (1 kilometre) and Tarragona near the Puerta Aventura theme park (10 kilometres). Alternatively, some 72 kilometres to the north is stylish and modern Barcelona, Spain’s third largest city. The site shop sells bread and offers a restaurant and bar. A small castle with coastal views and a restaurant is nearby, in addition to a number of bars and cafeterias in the resort.